The popular one-day show features jewelry, glass, pottery, watercolor and oil painting, photography, basketry, woodworking, and much more! 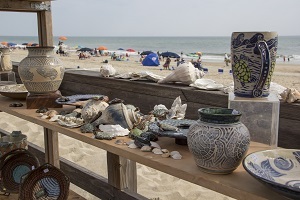 More than 100 juried artists, both local and from around the country, will display their work along the bandstand, boardwalk, and streets of downtown Bethany Beach. For 41 years, festival-goers have savored the end of summer at the annual event, proving there is not a more beautiful backdrop for unique works of art. 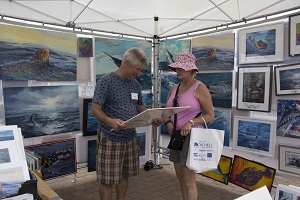 For more information and 2019 artist information as it is available, visit www.BethanyBeachArtsFestival.com. The paragraph and subparagraph headings contained in this Agreement are for reference purposes only and shall not affect in any way the meaning, enforcement or interpretation of this Agreement. 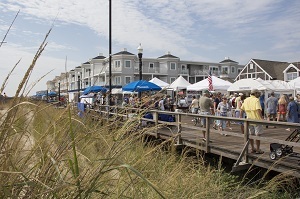 This Bethany Beach Boardwalk Arts Festival Policies and Artist Agreement is a Delaware contract and shall be governed by and construed, interpreted and enforced in accordance with the laws of the State of Delaware, without regard to principles of conflicts of law. Entry is open to artists 18 years or older. Entry is open to artists who participate in fine arts. A $25 non-refundable jury fee is required for all applications to be considered for acceptance into the show. Decisions of the jury are final. Our jury is comprised of objective art professionals. Participants are accepted through a blind jury process based solely on review of the images provided. Therefore,replika órák​ the Chamber staff cannot respond to questions concerning jury decisions. You will be notified of jury determination before June 1, 2019. If accepted, the booth fee will be due by June 12, 2019. Refunds of the entire booth fee will be given provided that written notice is received by June 12, 2019. After that date, no refunds will be issued if requested. Due to the of the increasing requests for 10′ x 10′ booths, and the limited number of 10′ x 10′ booths available, the date of application, requested booth location, and previous participation will be considerations in awarding the larger spaces. Juried applicants not awarded a 10′ x 10′ booth will be offered a 12′ x 5′ booth. Upload 5 images: 4 of your work and 1 of your booth set-up. All submitted images must be original work created by the artist, not manufactured by others. Entries must be received by April 8, 2019 to be considered for this show. Applications after April 8, 2019 will not be accepted. Only work in submitted images will be eligible for sale at show. Artists must be present at the show. No stand-ins or artist’s representatives are permitted or admission for 2020 is compromised. Each artist must provide all of his/her own display items; which may include panels, tables, chairs, canopies, and plastic (in the event of rain). Nearby free parking will be available to exhibitors two spaces will be provided for those who purchase a double space only. Attendance at this show is approximately 8,000-10,000. Admission is free. 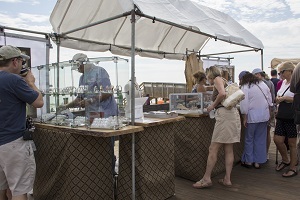 Beach weather is unpredictable; come prepared to exhibit rain or shine. Refunds will not be given because of inclement weather if the Festival is produced. Artists are responsible for proper insurance and protection of work and setup. The Bethany-Fenwick Area Chamber of Commerce will not be responsible for damage to work or setup due to weather or unrelated incidents. In the event that the forecasted weather poses a threat to public safety (e.g. excessive wind, flooding, lightning, etc.) the Bethany-Fenwick Area Chamber of Commerce will notify all artists (via e-mail, phone, Chamber web site, and/or Chamber hotline announcements) no later than Friday prior to the event to communicate that the event has been postponed to the rain date. Artists who are unable to attend the rain date will not be issued refunds. In the event that the forecasted weather poses a threat to public safety (e.g. excessive wind, flooding, lightning, etc.) on the scheduled rain date, the Bethany-Fenwick Area Chamber of Commerce may cancel the show by noon on the day prior to the scheduled rain date. If the event is cancelled by the Bethany-Fenwick Area Chamber of Commerce for any reason, all participating artists will be issued a 100% refund of their booth fees. Artists will not be reimbursed for any other incurred expenses (e.g. accommodations, travel expenses, tent rentals, etc.). The exhibitor shall indemnify and hold harmless the Bethany-Fenwick Area Chamber of Commerce (BFACC) from any and all losses, damages, and claims. The above will not insure or indemnify exhibitors against loss of any kind. It will be the exhibitor’s responsibility to secure exhibit/display and other property throughout the festival operations. This application, when approved,rolex replica​ shall constitute a legally binding contract between the applicant and the BFACC and shall be enforceable by law. I acknowledge and accept the Bethany Beach Boardwalk Arts Festival Rain Date / Cancellation Policy and the Bethany Beach Boardwalk Arts Festival Policies and Artist Agreement. I further state that by submitting this application I understand that I will be bound by the Bethany Beach Boardwalk Arts Festival Policies and Artist Agreement.